One estate, 18 karat yellow gold brooch. One round brilliant cut diamond (0.87 carats: VS clarity: F-G colour). Forty round brilliant, single cut and baguette diamonds (1.38 carats: VVS-SI clarity: G-H colour). Eighteen rubies (1.73 carats). 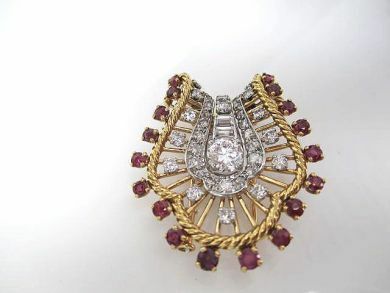 Possibly Chaumet. French marks on clasp.